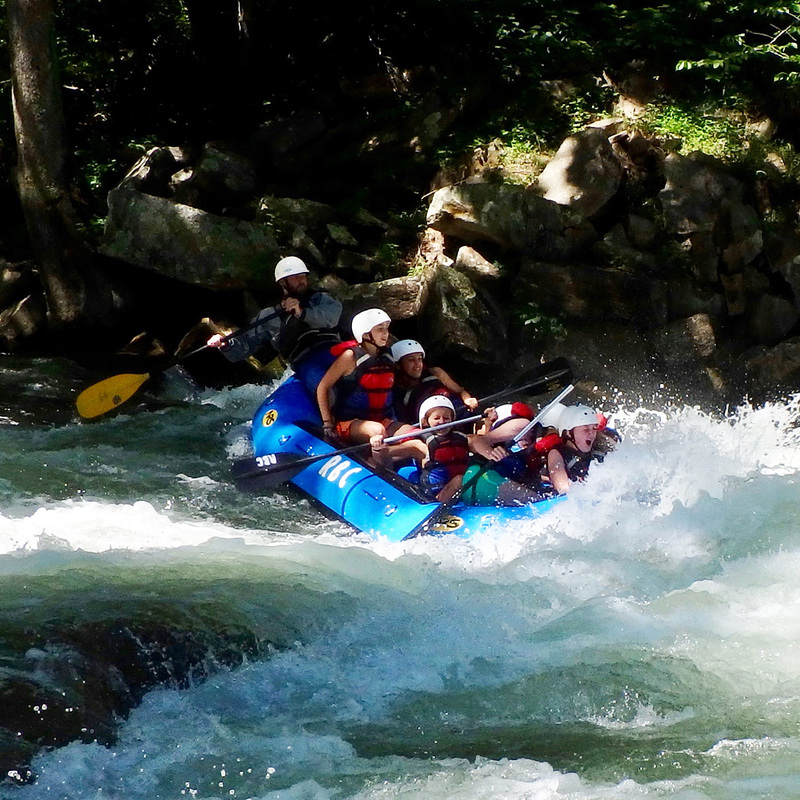 We took about 60 people whitewater rafting on the Nantahala River today. 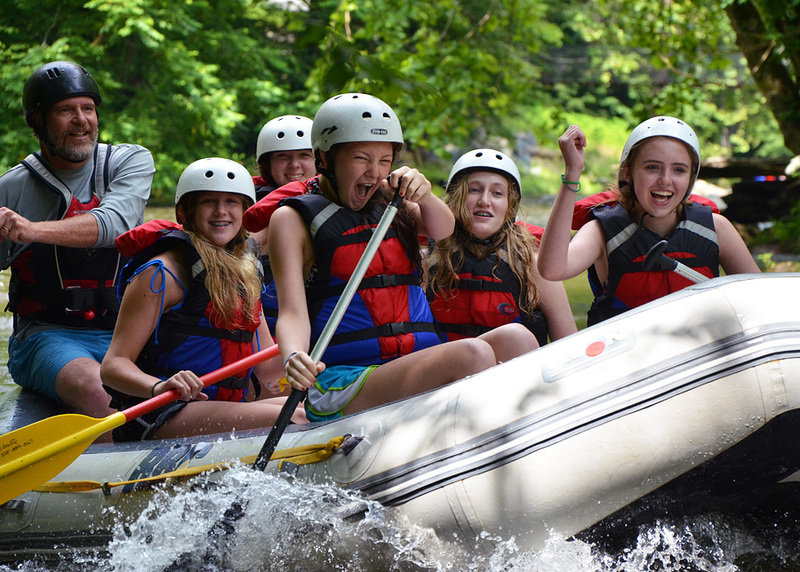 We offer this trip every year to all of the Middlers and Seniors, and for many it has become their favorite outdoor adventure experience of their session. One bus of girls chose to spend the night at our outpost near the river, enjoying a little camping complete with maybe one too many s’mores before bed. The river trip itself delivered plenty of frigid water and thrilling drops through the class II and III rapids, but as you can see the girls added a good dose of silliness to the trip as well, posing for photos, making “high-fives” with their paddles, and riding “the bull” until falling back into the boat or forward into the river. 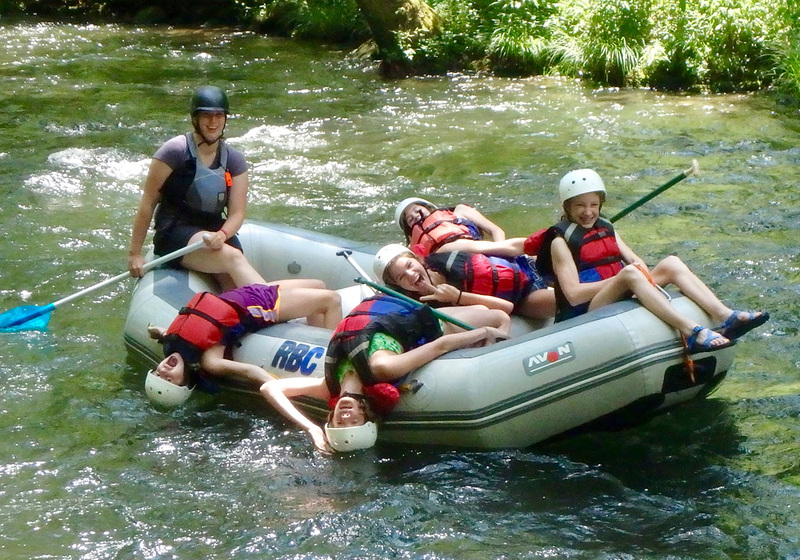 Using our own equipment and guides the girls already know helps this extra silly fun take over. Songs and spirited shenanigans all the way down! Be sure to take a look at the online photo gallery. Today’s shots are particularly good. We have two full-time photographers who roam around camp trying to capture the action. At times only one is working, and at others, both are busy trying to snap a photo of every girl (at least one!) while also showcasing the different activities all happening at once. It’s difficult to be everywhere at the same time, but especially when both photographers are working, they do an amazing job keeping the gallery interesting. 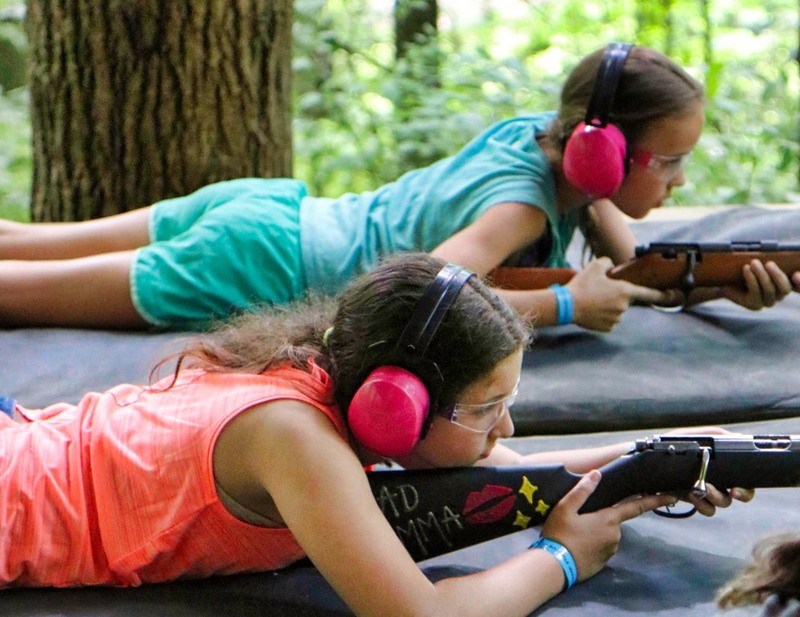 Spend a few minutes scrolling through the photos and you will discover the incredible variety of things your girls are doing— riding, shooting, jumping, zipping, weaving, tie dying, playing, swimming, balancing, paddling, acting, painting… —but also I hope you’ll get a sense of how they’re learning along the way. 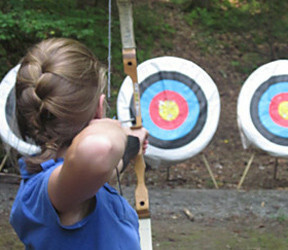 Every activity involves specific skills, techniques, terminology, equipment or materials. Some require careful athletic coordination, imagination or creativity. Personal qualities are being exercised too: perseverance, bravery, patience, humility, and stamina come to mind. Rockbrook’s organized camp activities bring all of this together, and when led by such amazing, caring instructors, and when the forces of “positive peer pressure” (“Let’s sign up for kayaking!”) soften feelings of hesitation, girls grow in astounding ways. 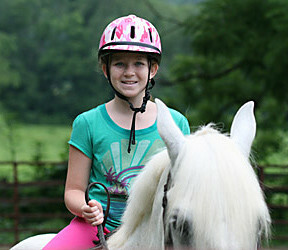 They experience not just something novel and fun; they discover new success and confidence too. 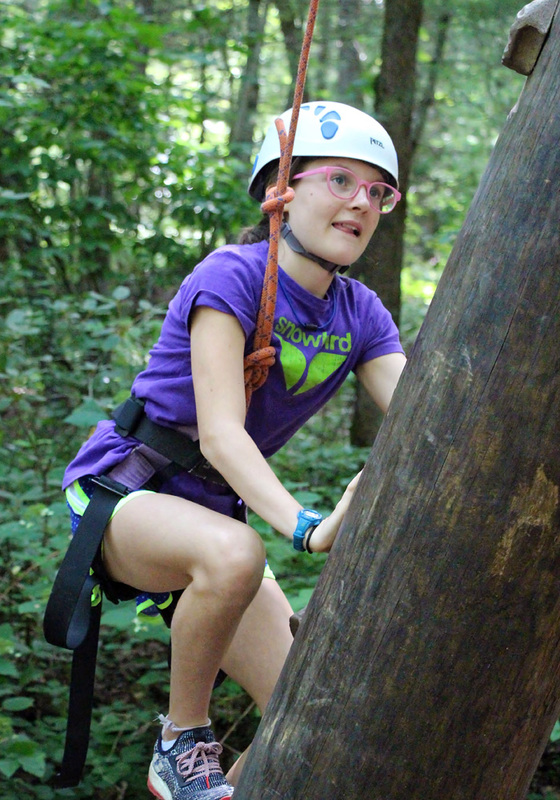 Climbing is a great example of this learning, of the broad educational (in the best sense of the word) benefits of camp activities. 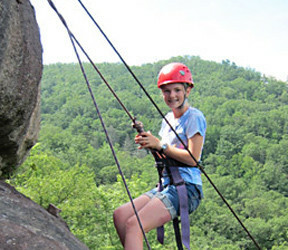 Of course, beginners learn about the special equipment needed to climb safely: the kernmantle rope, helmet, locking carabiners, belay device, and harness with its array of straps and buckles. 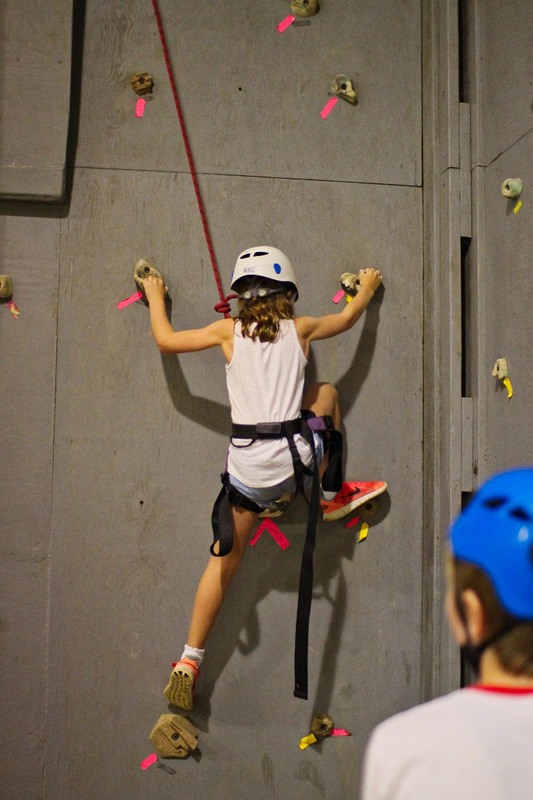 They learn about different climbing techniques: various holds, body positions, and balancing stances. 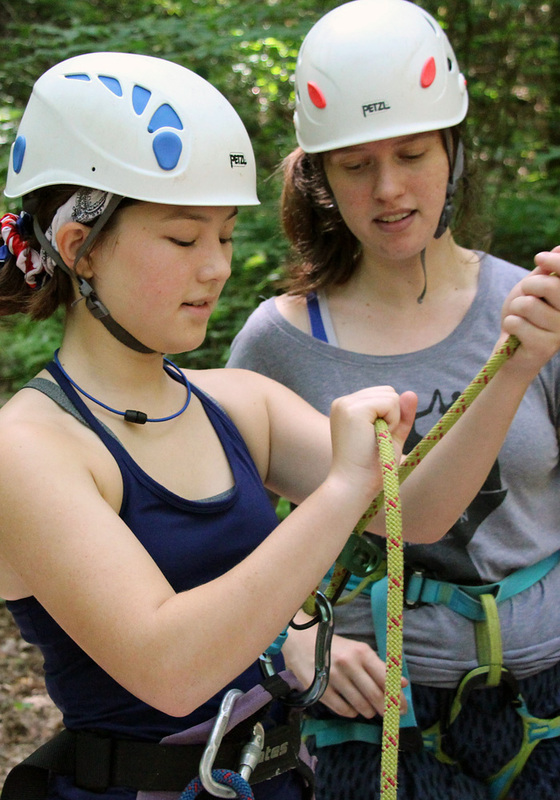 The older girls can learn how to belay. There are mental skills also: concentration (“Don’t look down!”), determination, and problem solving each step of the way, for example. Emotions like fear and frustration often play a role too, not to mention the elation of achieving the goal of reaching the top of a climb. Climbing means overcoming your fear of heights (which we all have to some extent) by learning to trust, to trust the safety equipment and ultimately to trust your own ability to climb effectively. 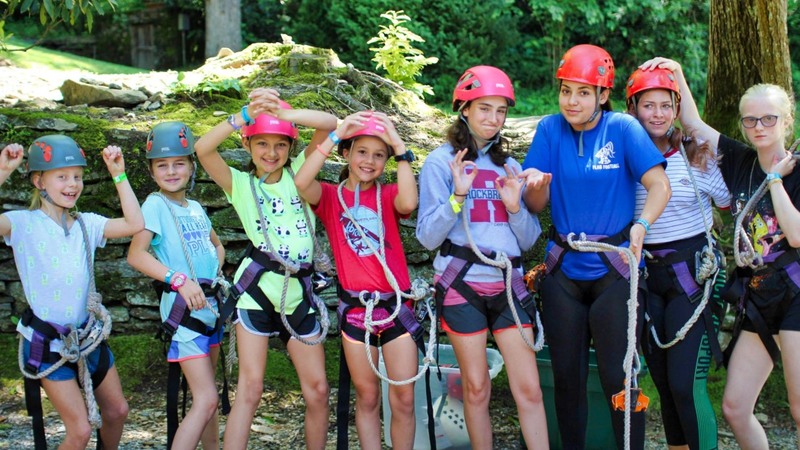 Whether it’s on our high ropes climbing tower, wall in the gym, the routes on Castle Rock, or on Looking Glass Rock in the Pisgah Forest, the Rockbrook girls who climb are learning so much more than simply “how to climb.” So much more! During breakfast we announced another special activity for the girls today: a visit to George Peterson’s woodworking studio for a tour and project workshop. 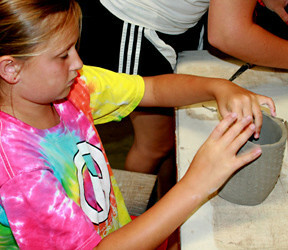 George has offered different workshops like this to our Rockbrook girls for three years now. 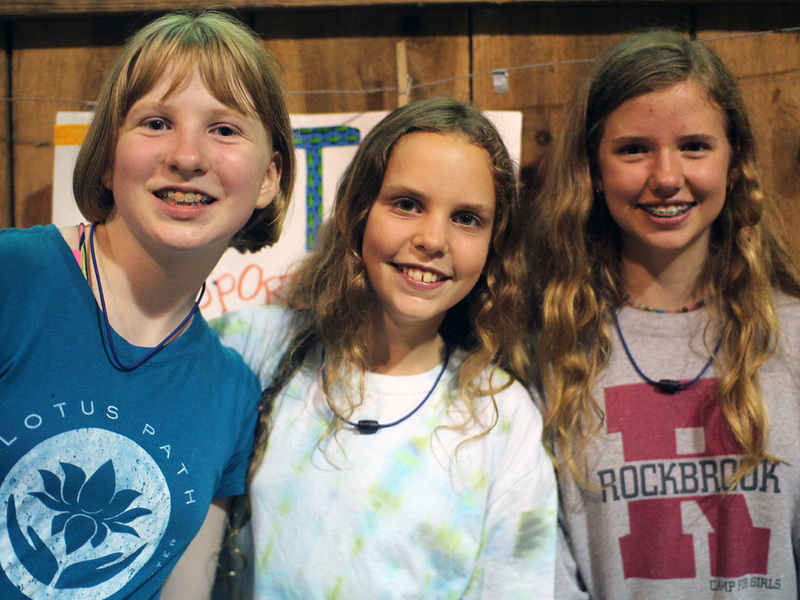 His wife Margaret is an Alumna, and his two daughters attend camp every summer. George is widely known for his art, his creative carving, etching, burning and painting of different species of wood, old wooden skateboards, and skis. He’s displayed his work in galleries in New York, Tokyo, San Francisco, and Atlanta, and continues to work as a professional artist out of his studio, The Circle Factory. When the girls arrived, George first toured them around the studio pointing out several of his specialty tools, like drills, saws, torches, and the giant lathe he uses to turn logs into huge bowls. The girls were fascinated by the stacks of raw materials they saw too: slabs of wood, old skateboards, leather cords, paints and inks. There were finished pieces and works in progress displayed almost everywhere. 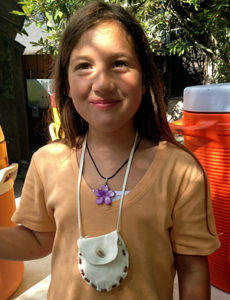 Each girl was then able to make their own project, a leather and wood bracelet. 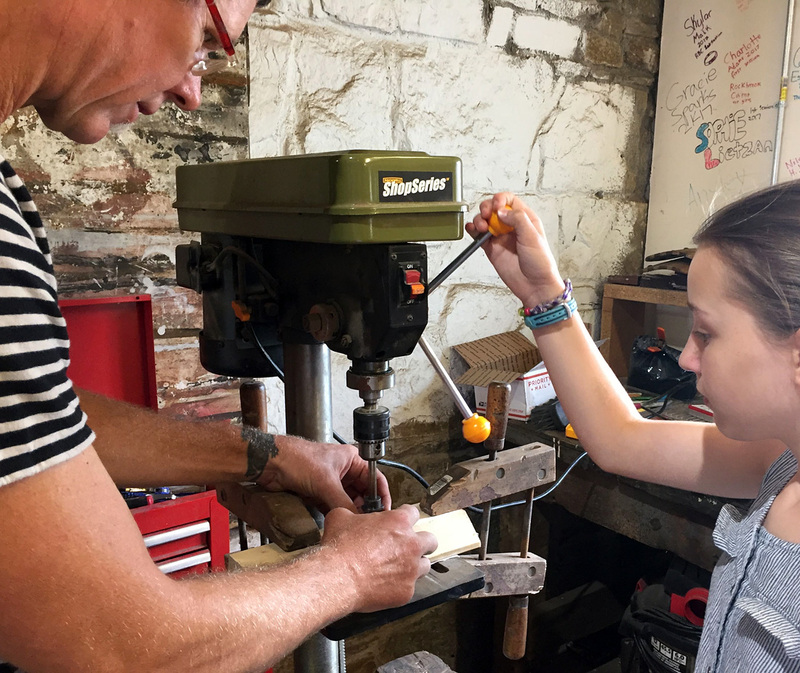 With help from George and Margaret, the girls used a drill press, a carving tool, sandpaper and a metal “RBC” brand to shape a small chip of multicolored skateboard that they then sewed to a leather strap. 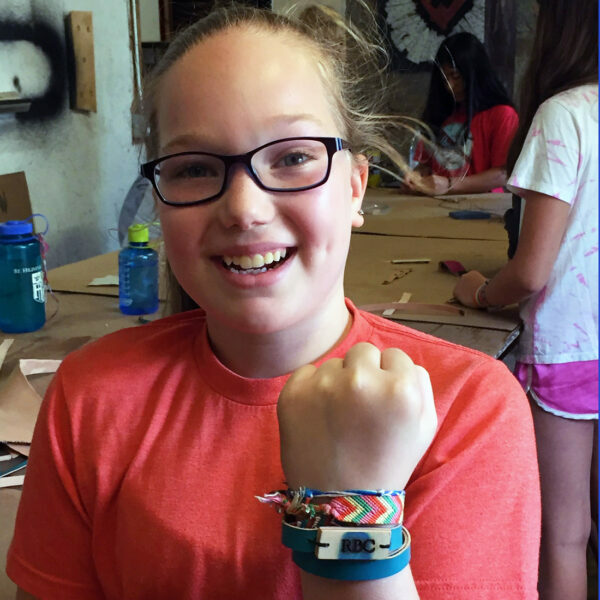 There were multiple steps to the project, but the girls each had a cool, one-of-a-kind bracelet to wear proudly when they were done. For all of us who stayed in camp, our morning was filled with a whole range of activities. Girls were climbing high above camp on Castle Rock, trying to “slay the dragon” (which is lingo for climbing to the top of our route called “Dragon Tail”). Others were whooping as they flew through the trees on our zip line course. 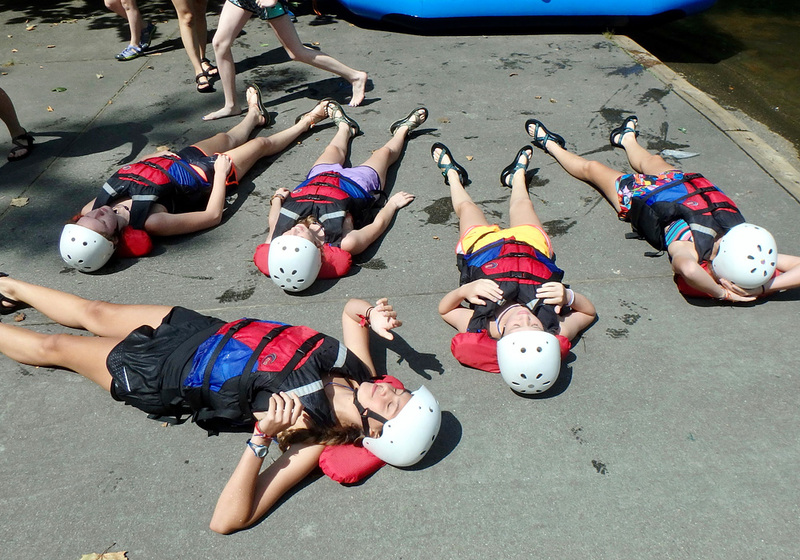 A few Senior girls took on the challenge of climbing the Alpine tower blindfolded, while at the lake, Sarah and Stephanie, our kayaking instructors, were teaching a roll clinic. Archers and riflemen (girls actually!) were gleefully shooting holes in their targets. Equestriennes were gliding their horses around the arena, outdoor ring, and jump course. 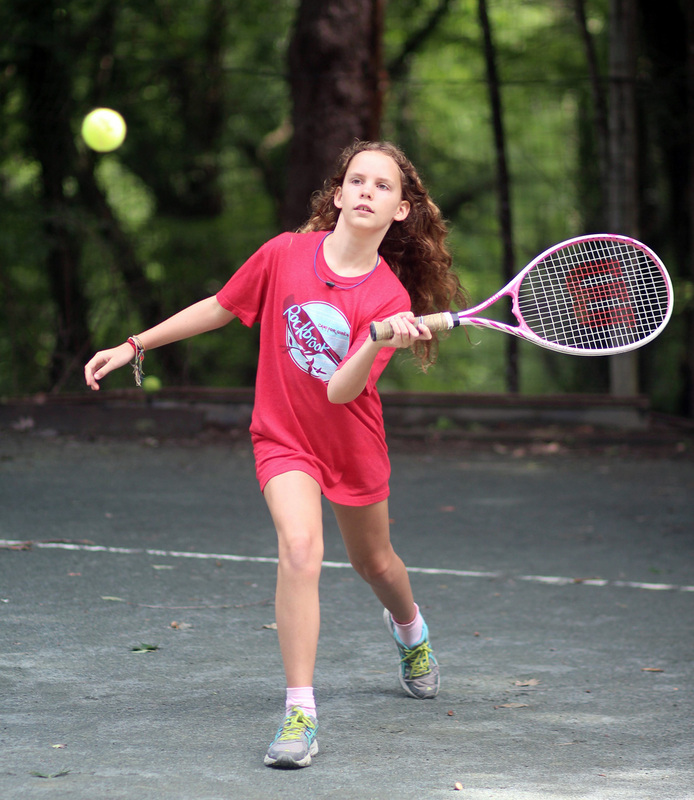 Girls played tennis; they shot basketball, and swam laps in the lake. Of course, there was non-stop arts and crafts too, from weaving on the loom to stringing beads and glazing pottery, making candles and blended dot painting. It’s difficult for our photographers to capture all this activity— though they do pretty well! — but you can tell, this place is bustling! Just as lunch ended today and the girls were heading back to their cabins for rest hour, the sky began to darken and suddenly our lightning warning system sounded its alarm. A few stragglers took off running, and about 3 minutes later we all jumped when a loud crack of a lightning struck nearby, not so close that we could tell where it hit exactly, but close enough to be frightening. Fortunately, everyone was safely inside, but then as the storm built overhead, the wind picked up, the temperature dropped 15 degrees, and a hard rain began to fall. A moment later, it was hailing pea-sized hail! For about 5 minutes, that storm passed by and put on quite a show. Several girls told me later that this was the first time they had ever seen hail. 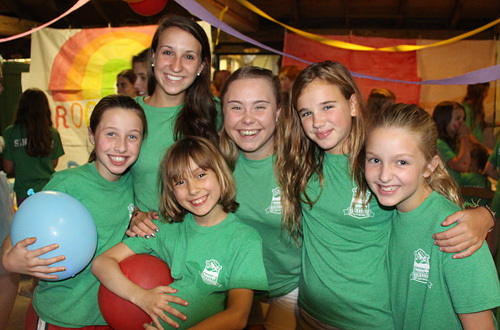 The main event of the evening was something many of the girls, particularly the Senior campers, anticipate and look forward to every summer: a dance with Camp Carolina. This was a chance to get cleaned up a bit (find that hairbrush), pull out a special outfit, costume, or glittery makeup, but mostly to enjoy jumping around with friends to favorite pop songs. 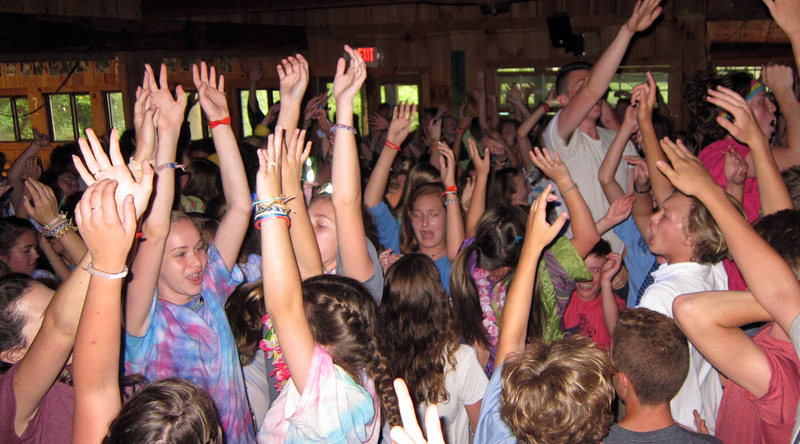 With both camps involved, there are too many children to hold a single dance for everyone, so we held two again: one dance at Rockbrook for the younger boys and girls, and another at Camp Carolina for the older ones. For about and hour and a half, both dances kept everyone moving, pausing now and then for a photo or a water break. 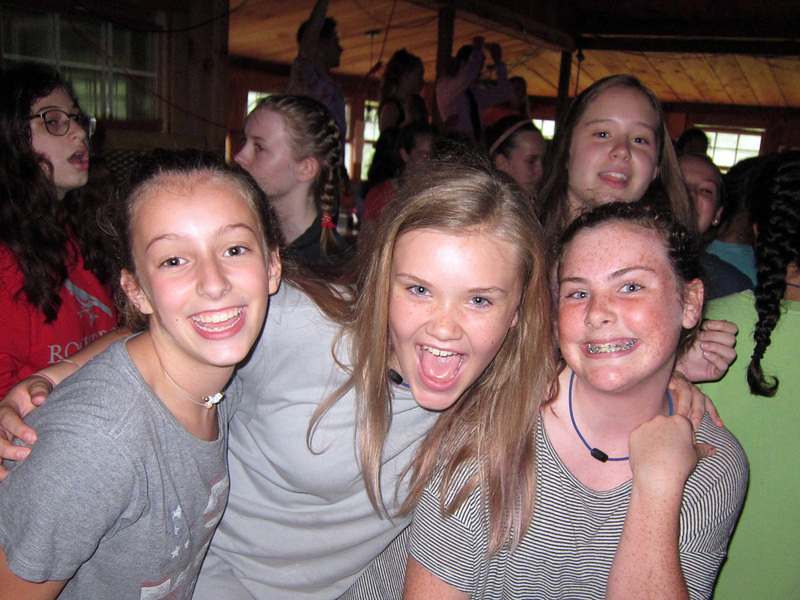 Everyone was hot and sweaty by the end of it all, but the girls had a great time dancing together and singing along to the songs. Oh, and there were boys there too, though that didn’t seem to matter much. It was a fun, classic way to spend an evening at camp. The first sign is the red and white balloons floating at the entrance, and the second is the smiling Hi-Up campers greeting you partway up the driveway. Then at the top the hill, when you see the mob of cheering counselors dressed in their staff uniforms, it’s clear something special is happening, something VERY exciting. It’s the opening day of camp! 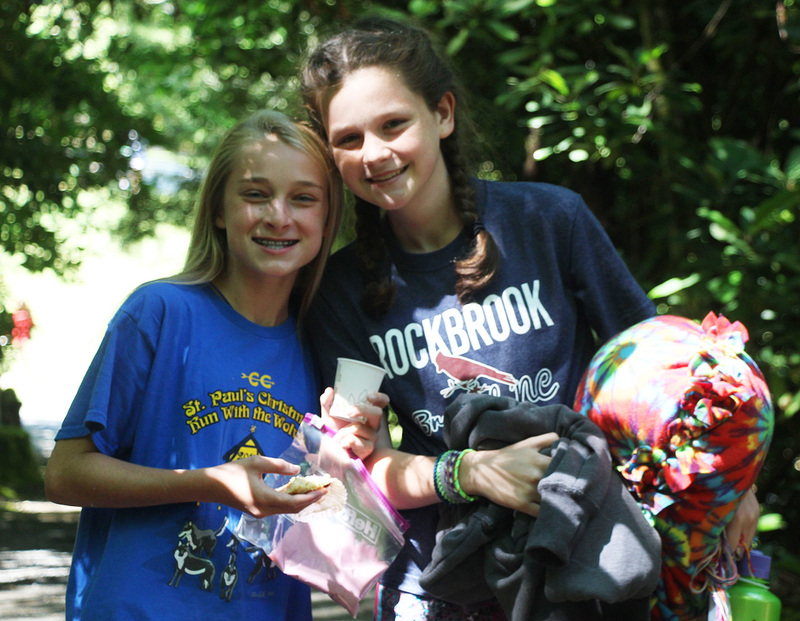 …in this case, for the mini session campers arriving to join the full session girls who have been at Rockbrook for two weeks now. For everyone— new and returning campers, and all of us already at camp —this is an exciting day. 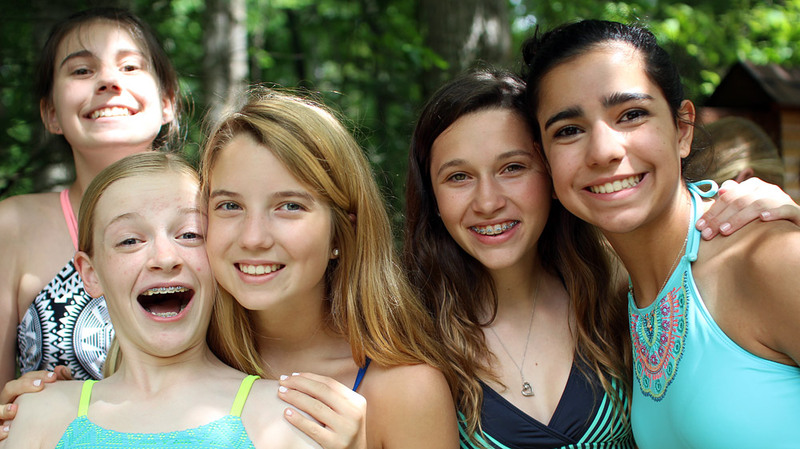 It means camp can finally begin for these girls arriving, reuniting with camp friends from last summer, and equally, it means we all have a renewed chance to make new friends in this active outdoor environment. It was particularly cool and foggy first thing this morning, with the Dew Point (62 degrees) almost equal to the temperature (62.5), and, according to our camp weather station, with 99% humidity, the fog was really thick. It was the perfect morning to wear long sleeves, or, as one camper decided, to wrap yourself in a blanket at breakfast. When the sun popped over the hill, miraculously burning off the fog, we were treated to a perfectly warm, bright summer day ideal for exploring the camp, meeting all these new people, and then enjoying sample activities like a hike through the woods to Rockbrook Falls, jewelry making in the shade of the hillside lodge porch, archery, and gaga ball. We held a quick assembly on the hill right before lunch to introduce everyone arriving to the directors and program staff, to recognize the cabins with the best inspection scores (awarding them the mop trophies), to learn about our lightning protocol (in response to our Thorguardian system) and the boundaries of the camp, and just to enjoy singing a few songs together, charging up our camp spirit. An orientation to our waterfront area was also an important part of the day. 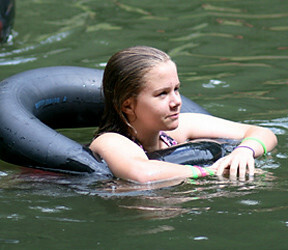 We want to make sure everyone at camp understands our tag system and feels comfortable swimming in the lake. The new girls zipped right through their “swim demos,” happily leaping in the water to earn their blue, green or yellow swim necklaces (Notice them being worn by the four girls below). These soft elastic necklaces indicate to the waterfront staff a camper’s swimming ability and thereby where she can safely swim in the lake, in the deep areas, or perhaps restricted to the shallow section, for example. 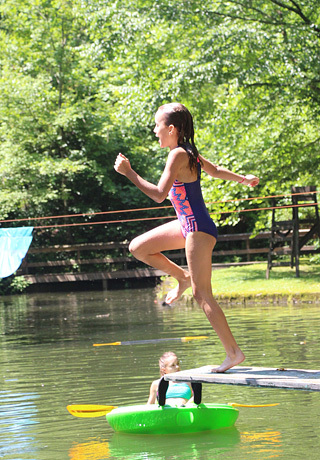 We make it possible for everyone at camp to enjoy the lake in some capacity, and the lifeguards are always willing to help a girl improve her swimming skills if she’s interested. 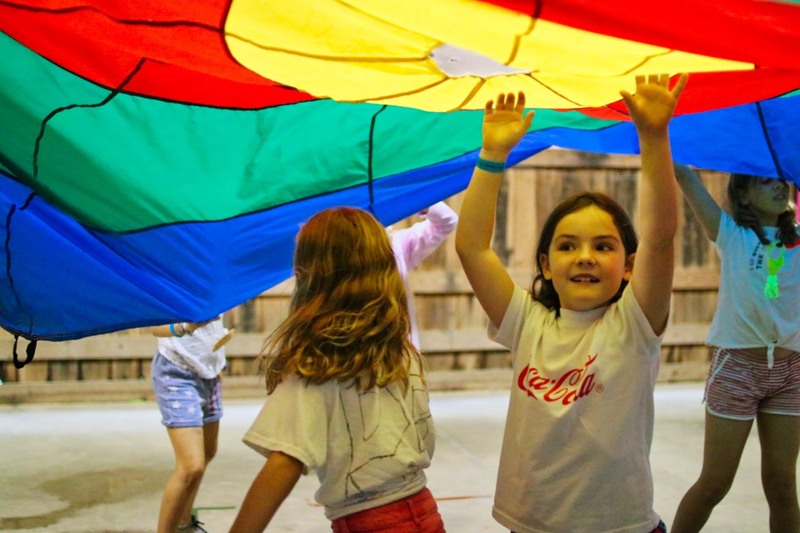 We always plan something big for Sunday afternoons, some kind of all-camp event that integrates many of the components that make a great party—music and dancing, costumes that revolve around a theme, snacks, activities, games and challenges with prizes to win. What better way to launch our new camp session too? 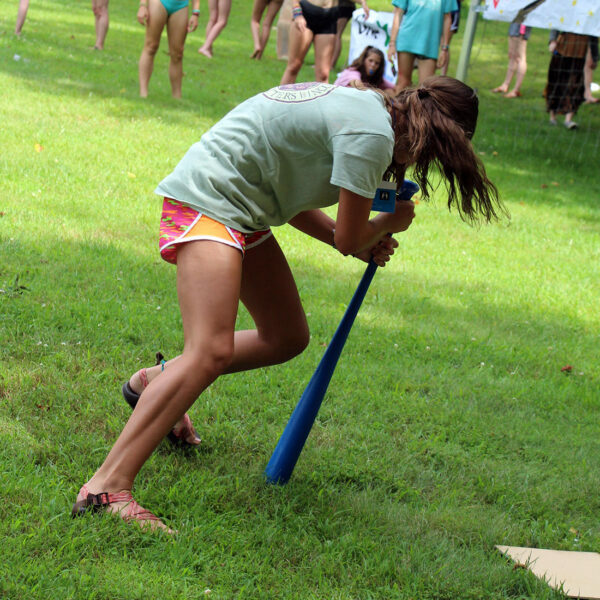 So with the help of the full-session Senior campers and counselors, we held a Star Wars themed carnival, or more precisely, a “Jedi Knight Training Academy” down on our landsports field today. There were a dozen different activity stations, each related to Star Wars: “Jedi Agility Training” that included a lightsaber duel with Darth Vader, a “Death Star Destruction” shooting game that used Nerf pistols, and an archery game where the girls had to hit a Sith solder with a paint-dipped arrow, for example. 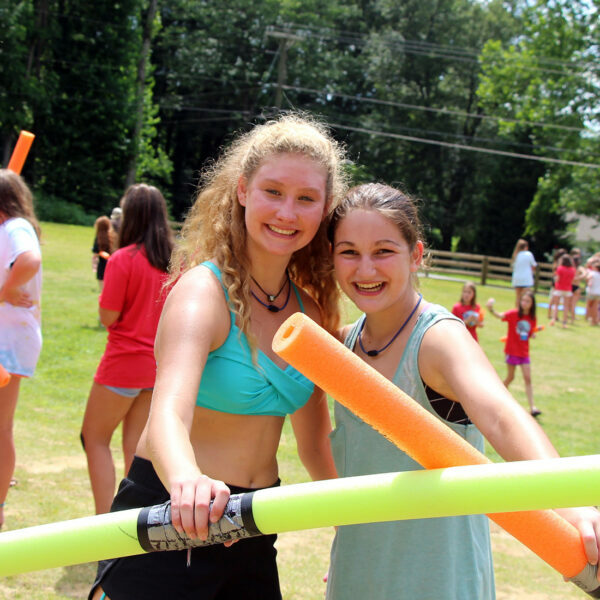 The girls made their own lightsabers using a foam pool noodle and different types of tape. They solved a matching game puzzle, and got their faces painted (“The Face is with You”), one girl turning her whole face into Yoda’s! We had girls dressed as the character Rey, several Jedi Knights, Yoda, and of course many with the hairstyle of Princess Leia. 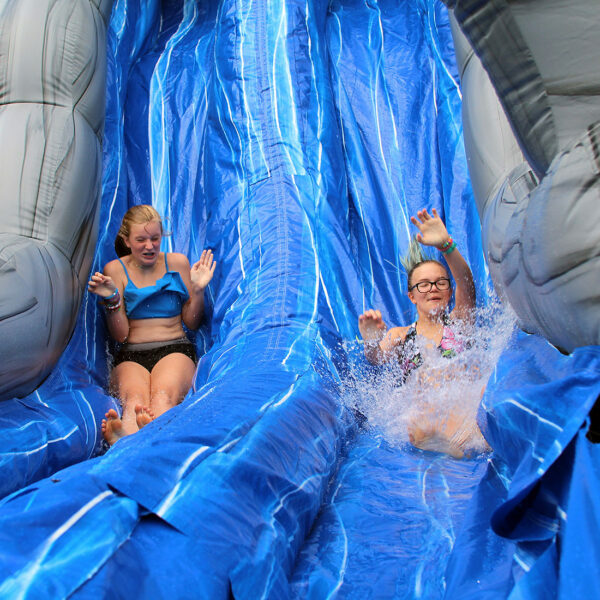 One highlight of the event were two huge inflatable games: a 25-foot tall, dual water slide, and a challenging obstacle course called “Leaps and Bounds.” The girls lined up for multiple slides and leaps on each. Meanwhile, our snow cone machine ground ice for snow cones all afternoon, helping keep us cool in the sun. 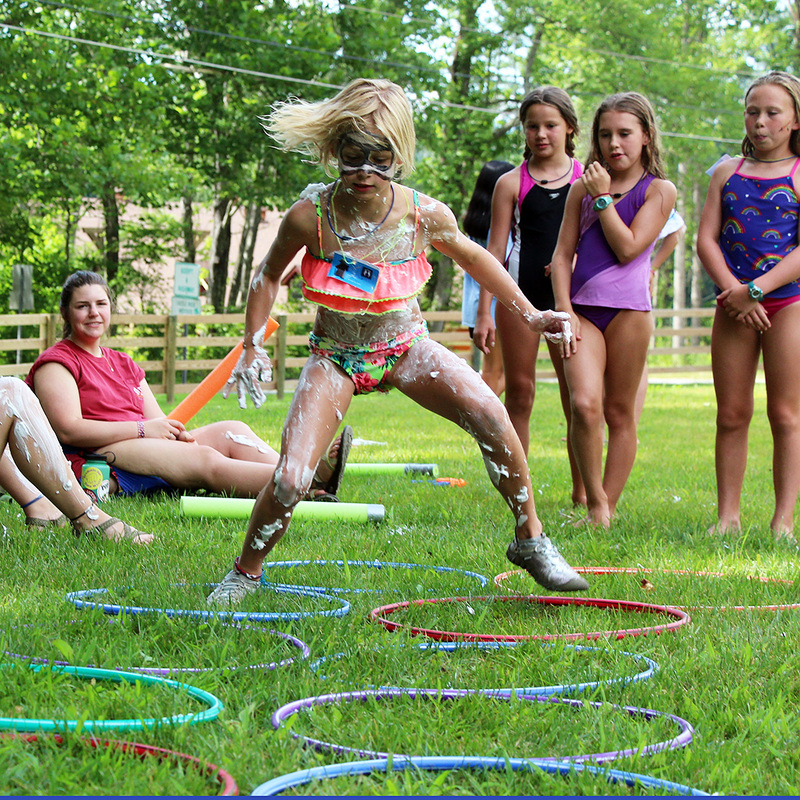 Group dances to favorite songs, racing about with water pistols, activity in all directions, we had an excellent camp party going on! We’ll be ready for our first full day of camp activities tomorrow, the girls scattering and eager to give everything a try. Stay tuned; it’s going to be great! It’s been an amazing few weather days, with everyone surprised by how cool it’s been. 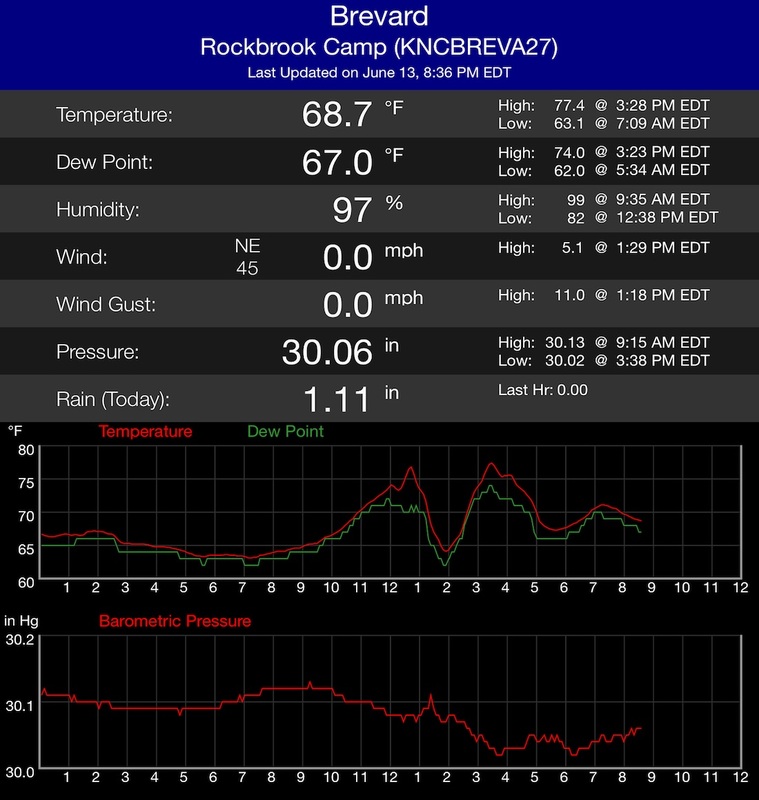 If you’ve been checking the Rockbrook Weather Station, you know what I mean. For example, this morning it was a chilly 51 degrees (! ), which means overnight we had perfect sleeping weather (in our open-air cabins), and in the morning everyone layered up with sweat shirts, long pants, and in some cases hats. The humidity has also been unusually low, so as the day warmed into the 70s with clear blue skies, it felt wonderful to be outside. It didn’t take long for the girls to shed their layers and enjoy the sunshine as they romped about the camp for their activities. So many twins! 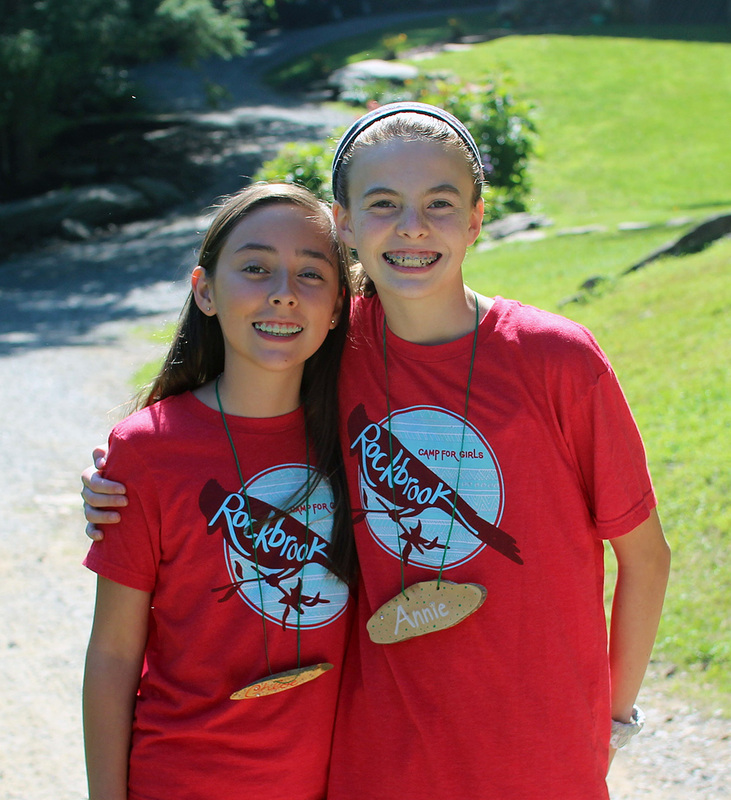 Not actual twins (mostly, since we do have a few sets of biological twins at camp right now), but costumed twins could be spotted around camp today, since, yes, it was “Twin Day.” We love costumes at Rockbrook, and tend to take any chance we can to dress up, to put on something— and the wackier the better —that’s out of the ordinary. There’s something inherently fun about taking on a different character, perhaps completely changing your hair (neon purple! ), wearing a shiny black cape, or even changing your accent (Arrrrh, pirates!). 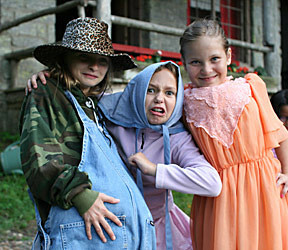 It’s good fun to dress up, but more importantly, it’s active creative fun, and not some kind of passive entertainment. There’s no recipe or formula for how to make your twin costume; you and your friend have to decide. Same shirt, shorts, glasses? What about hairstyle? 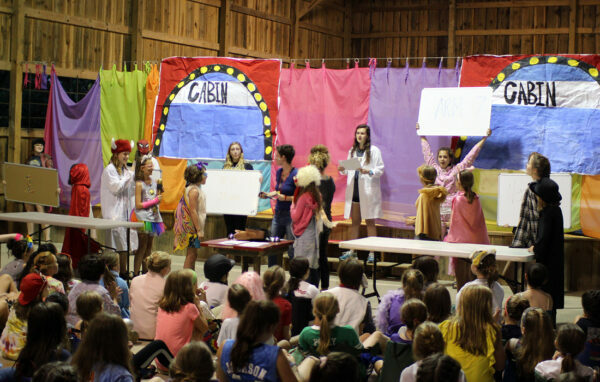 And since our dress up days at camp are always open to the whole group, there’s both a performance element, and a sense of pride that comes from presenting your costume creativity to everyone else. In this way, participating in a group costume event like Twin Day provides a real boost to our (admittedly zany) community. When we’re into it, it brings us together. It can be a little disconcerting to see two girls wearing lab coats playing tetherball before lunch, but you can’t help but smile at the sight. While girls were trotting with horses, zipping high among the trees, and tying t-shirts for dye in camp, about 60 middlers and seniors spent part of the day in Swain County rafting the Nantahala River. The Nantahala has been ranked as the best class II whitewater river in the southeast because it offers both incredible scenery as it passes through a steep, forested gorge, and a perfect mix of whitewater rapids, calm stretches, and an exciting class II+ drop for a finale. 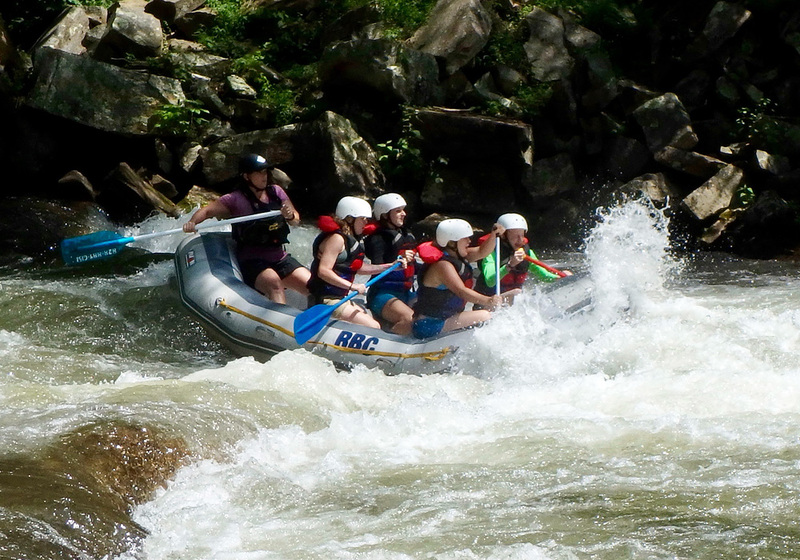 Back in the early 1980s the US Forest service awarded Rockbrook a permit to raft the Nantahala, and since that time we are one of the very few camps to do so with its own equipment and guides. 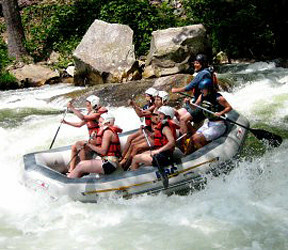 Over the years, taking a whitewater rafting trip has become an extremely popular adventure outing for Rockbrook girls. 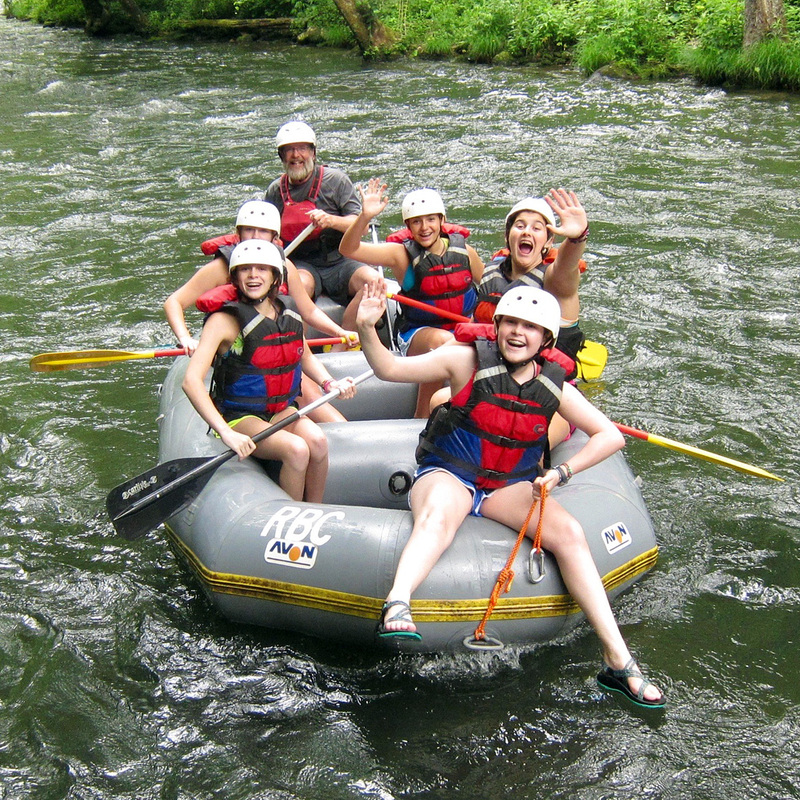 There’s no additional charge and we offer the trip to everyone who is old enough to go (that’s a limit placed on us by the Forest Service): the middlers and seniors. 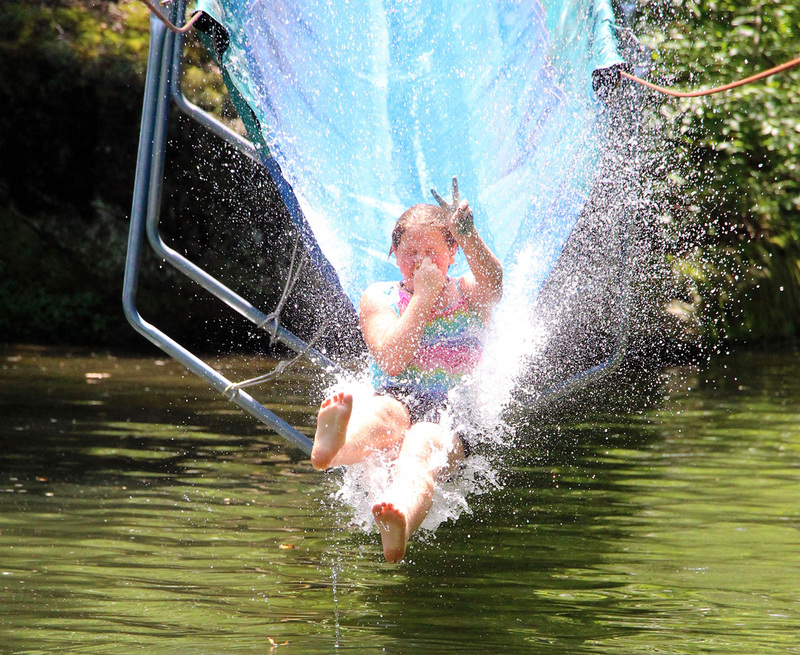 One camper explained to me that this was her fourth time down the river— every year she’s come to camp —and it’s more fun every time. 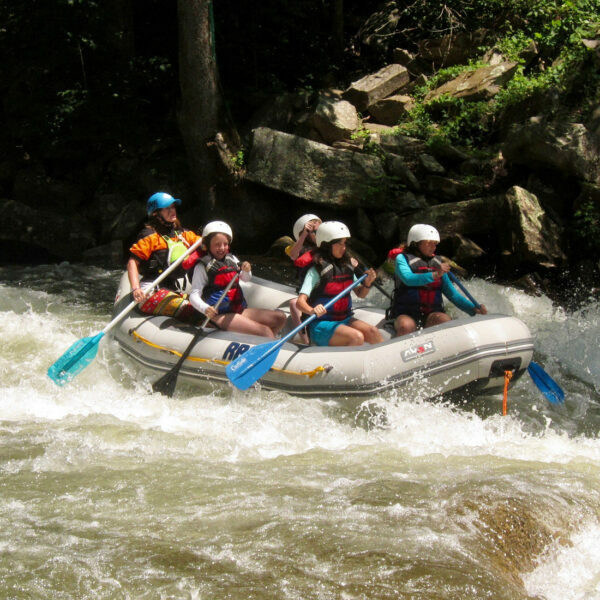 “Best trip ever!” One of the defining features of the Nantahala, and I’m sure you’ll hear about this from your daughter if you ask her about rafting, is the temperature of the water. Thanks to the frigid bottom-of-the-lake water released into the river by the Duke Energy hydroelectric project, falling into the 50-degree river is an unforgettable, wide-eyed, breath-taking experience. Toward the end of the 2-hour trip, it’s a safe bet that most toes are numb. Of course, there’s a thrilling rapid around each bend of the river, and a boat of laughing, singing friends to keep the whole trip exciting and fun. Back at camp, our evening program tonight was an all-camp special event down in the gym, and as you might guess, we turned on the costumes again, this time to the theme, “When I grow Up.” This is a brilliantly conceived costume theme that can accommodate the conventional (I saw a doctor or two, a “professional equestrienne,” and a soldier, for example.) as well as the imaginative, like a shark trainer, a unicorn princess, or a food fairy. All of the costumes were resourceful, mostly eclectic and certainly colorful. 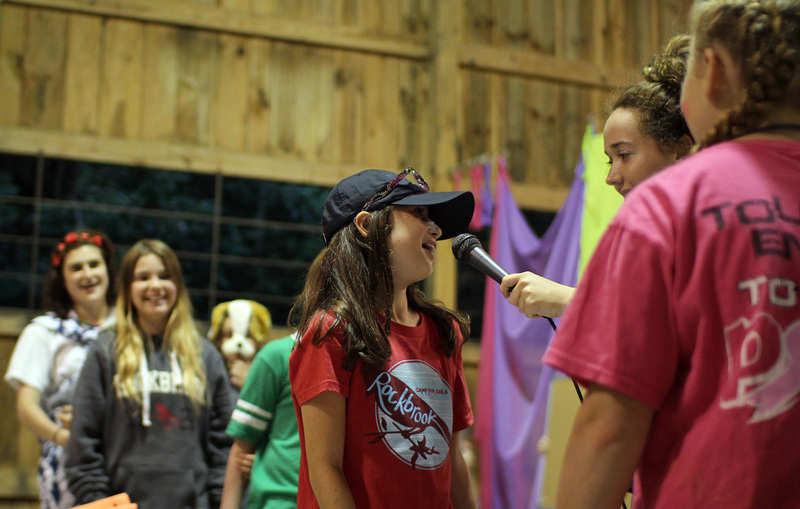 The event was a goofy spin-off from the popular game show “Family Feud.” For us it was more like “Cabin Feud” where groups of girls from each Line (age group) attempted to guess the most common answers to questions like: What’s a fruit that has lots of seeds? Or, What’s a sport that does not involve a ball? Or, What do teenagers like to do when they’re bored? Counselors knew the top 7 answers to each question and as team members correctly guessed answers, the team earned points. Meanwhile the audience rooted for their friends, shouted helpful suggestions, and had a great time following the competition. Each winning cabin (per age group) would receive a delicious-looking cookie cake trophy, so the audience went wild with enthusiastic cheering whenever a group won a round. It was a fun spirited evening celebrating our collective creativity. 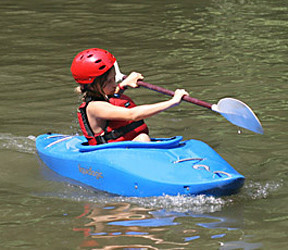 A little bit of rain mixed with mostly sunny skies is really the ideal weather for summer camp. We need the rain, of course, to cool things off now and then, sustain the complex biome of the forest and to replenish the creeks that feed our lake as they pass through camp. But since the majority of our activities happen outside, we also want plenty of warm sunny weather. 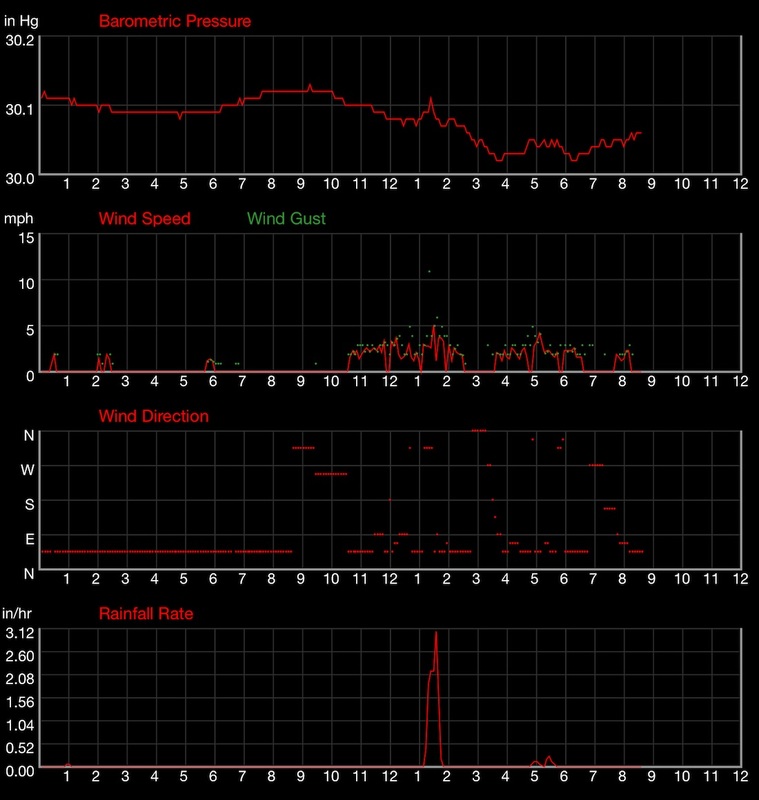 The last couple of days have provided exactly that, and if you can imagine it— today a beautiful sunny day marked by a “perfect storm.” Take a look at these graphs drawn from the Rockbrook weather station and see if you can spot when we had our rain today. We were all in the dining hall having lunch when suddenly at about 1:30pm the skies darkened, a gust of cool wind blew, the temperature dropped almost 15 degrees, and it began pouring rain. It lasted only 20 minutes, but in that short time we had an inch of water come from the sky! As everyone enjoyed a warm lunch of pasta, grilled chicken and salad, including 2 of Rick’s homemade sauces, the storm put on a show outside. 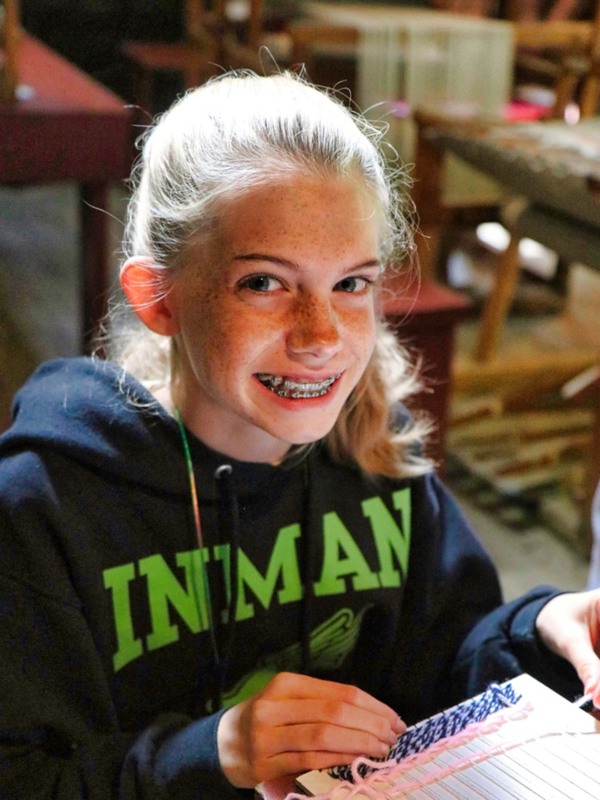 By the time we finished the announcements and it was time to check our mailboxes on the porch, the rain had tapered off making the girls’ walk to their cabins for rest hour, with everything cool, wet and glistening, all the more lush. 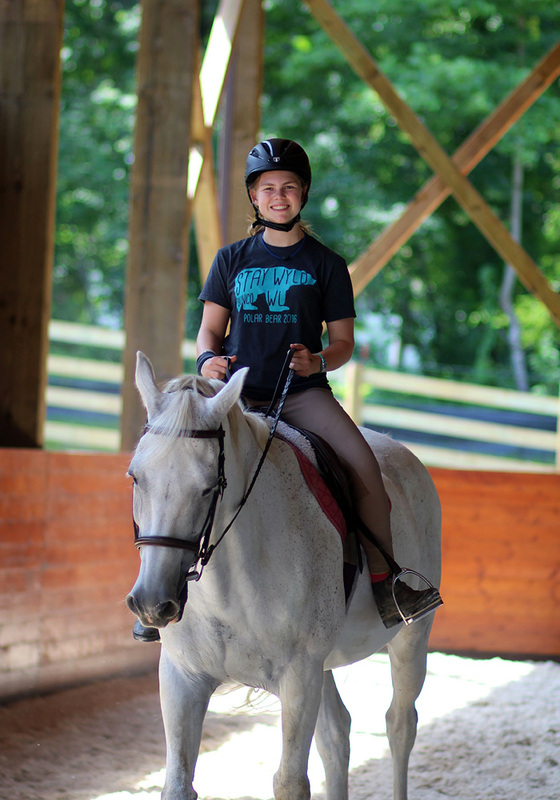 Glancing through the photo gallery online it’s pretty easy to see that the girls at Rockbrook are staying incredibly busy— hiking, zipping, shooting, riding, creating, simply playing —and having lots of fun. I suspect, however, that you know that this activity, outdoors and away from technology, this experience of having fun, also serves as the context for something more profound and enduring. 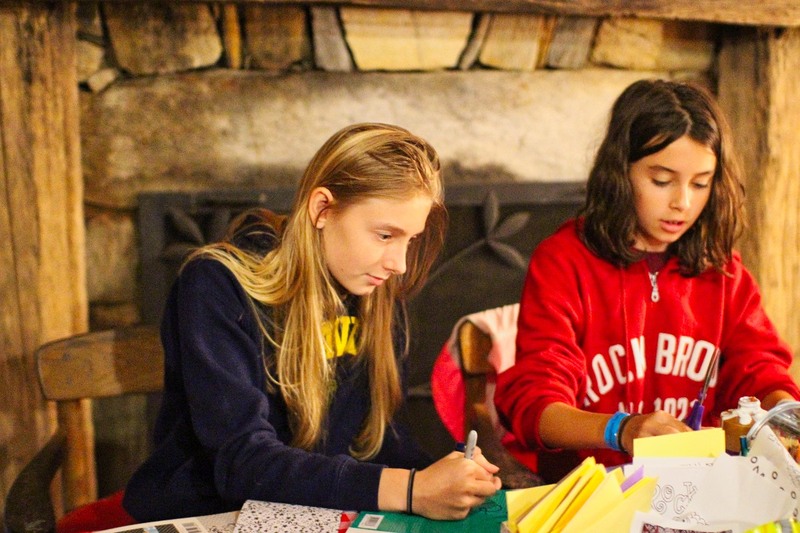 You know that camp is also educational in the best sense of the word. 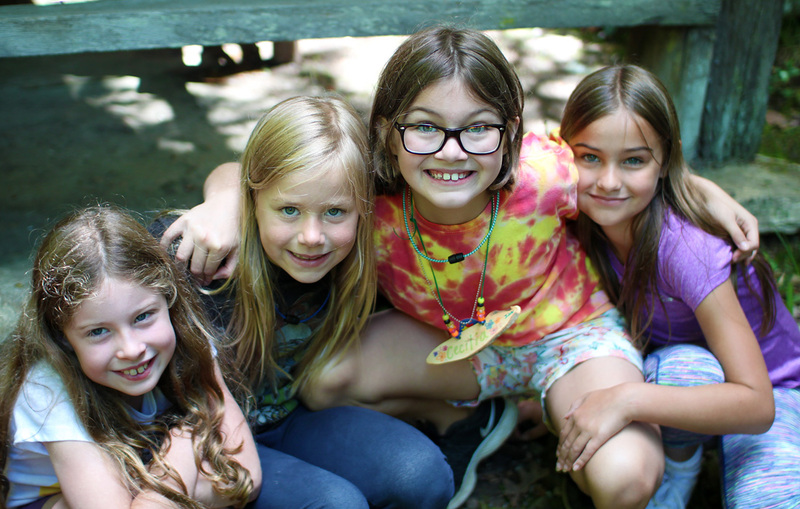 It’s how you answer your friend’s question, “Why do you send your daughter to camp?” You’ve got more to say than, “Because she loves it,” even though that’s true too. Time spent at camp is fun, but also formative. It’s different from life at home, but it’s that contrast that makes it an experience ripe for real learning. Back in the late 1800s and early 1900s, many camps focused on religious training, returning to nature, or physical fitness. You can see these same principles today guiding religiously affiliated camps, camps that organize around Native American themes, and sports camps. 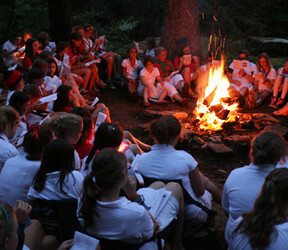 Recently, the American Camp Association has begun advocating a more general rationale for camp; it’s an environment uniquely well-suited to developing for children so called “21st century skills.” The idea is that beyond traditional academic knowledge (math, history, science, for example), students need certain other skills “critical to success” in the modern work world. Young people need better skills in oral and written communication, collaboration skills, critical thinking and creativity. They needed better work habits and character traits like leadership if they are to succeed. Here’s a great article to learn more about these 21st century skills. 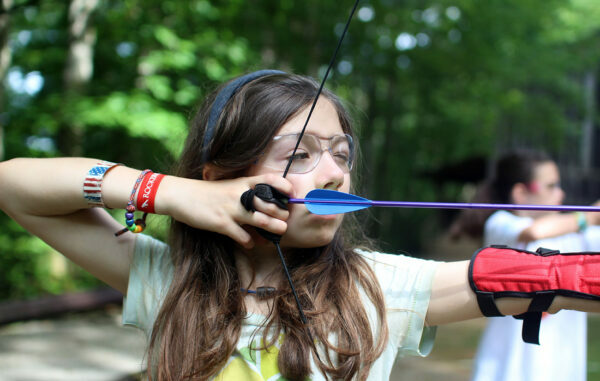 In this way, the camp experience encourages curiosity, communication and teamwork skills, and so forth. This argument makes sense. Camp is more than just fun, more than say an amusement park ride, because it helps kids gain these important skills they’ll need later in life when they get a job. And I can see how this benefit of camp, namely that it helps your child get ahead in our meritocracy, is valuable, but it also seems insufficient. It relies on a rather narrow definition of success, one defined by the working world and organizational productivity. I agree that the summer camp experience helps children develop important inter-disciplinary skills that will help them be more successful in their future job search, entrepreneurial endeavors, or career ambitions, but I do not want to reduce camp to some kind of job training. Once again, it’s more than that! 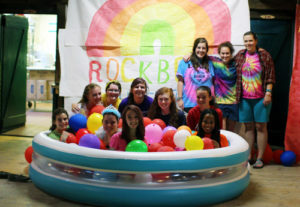 At Rockbrook camp is fun, yes. It helps develop 21st century skills, yes. But, perhaps most importantly, it encourages girls to develop more fundamental aspects of their character, namely those that define their relationships with other people. 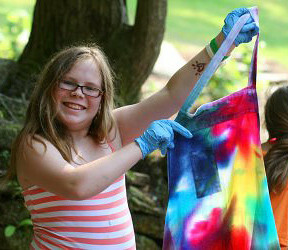 Camp life, being rooted in community, conveys core values like kindness, compassion, care and generosity. 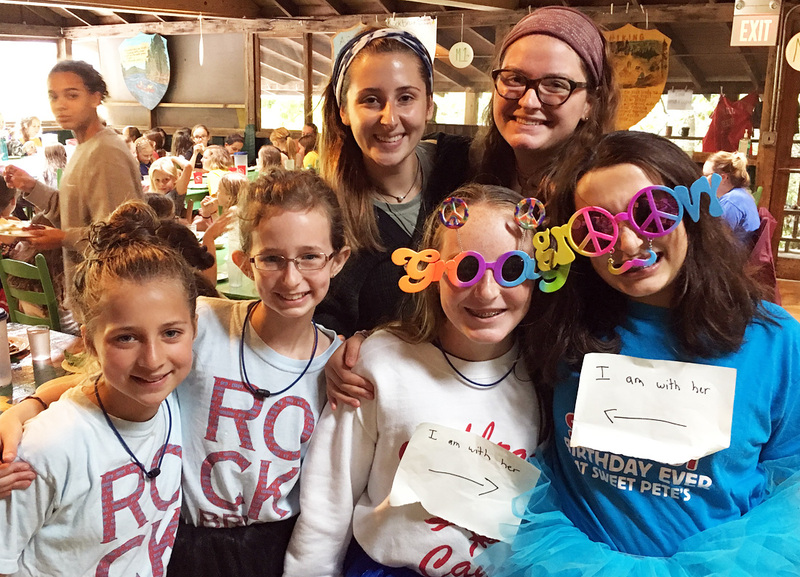 More than just “who we are,” camp celebrates who we are to each other, in relationship with all of those around us. 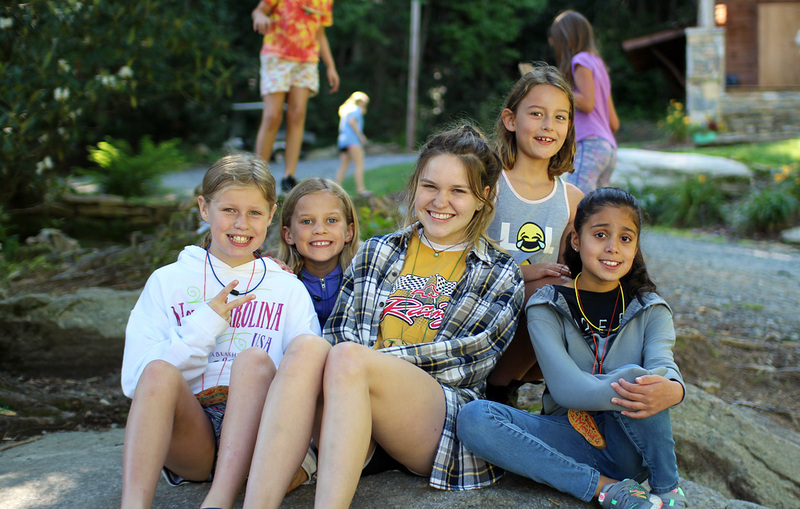 In other words, camp life, fueled by enthusiasm and encouragement, helps develop your heart, your respect, awareness and feelings for others. Two 13-year-old campers explained to Sarah the other day that these few weeks they have at Rockbrook each summer are for them their most cherished all year. They “live for” their time at camp. They’ll tell you camp is fun, and they’ll agree they’ve probably improved certain skills, but I suspect that’s not really why they love camp. For so many girls like these, there’s simply no other place they feel more content, included, and joyful. Why? Because camp is about heart. It is a place that puts positive relationships first, and fulfills one of the most basic needs we all share— to feel a sense of true connection with others. 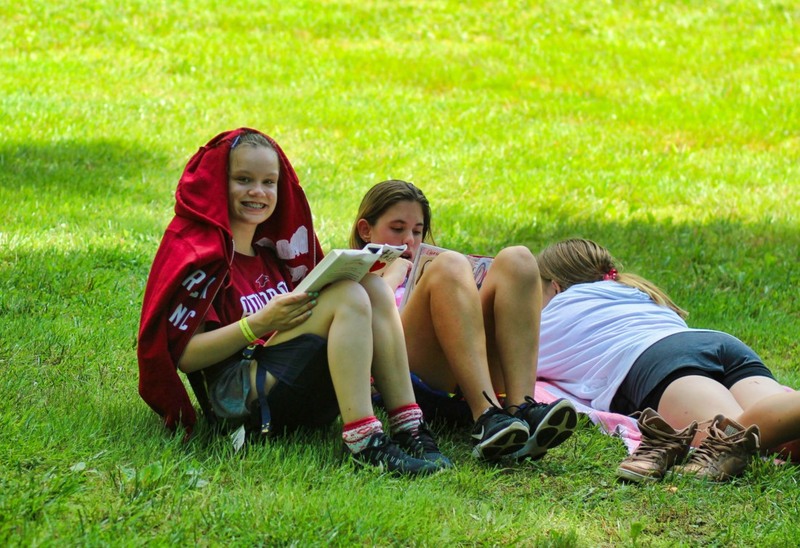 Certainly, there are many reasons why girls love camp, but developing your heart is surely one of the best. Today, our very first day of camp this summer, was exciting. We opened the summer 2016 summer season today with our first session girls arriving all morning beginning around 8:30. 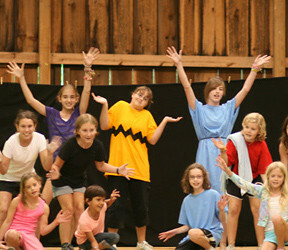 Like every opening day of camp, it was exciting for everyone— the campers, counselors, and directors alike. But there’s something special about the first opening day of the summer. We’ve had to wait for so long, have so many new fun things planned, been preparing the camp facilities, gathering equipment and supplies from new kayaks to yarn for weaving. 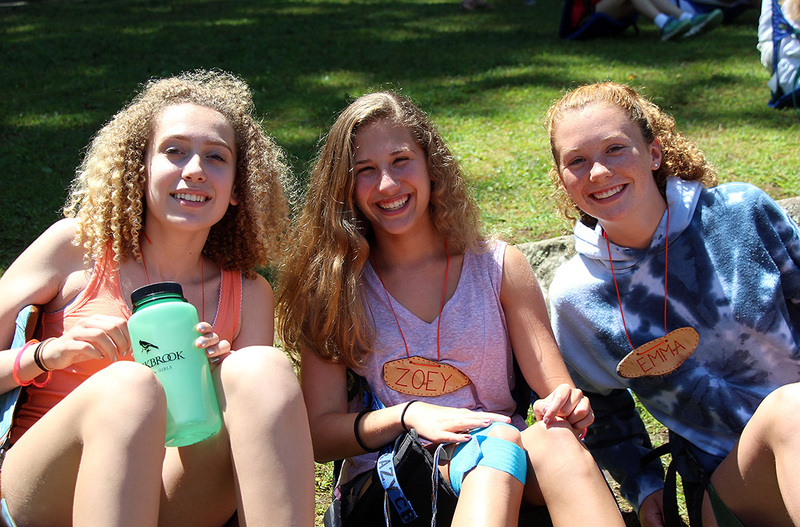 We’ve been thinking about camp for months, literally all year long waiting for this day! 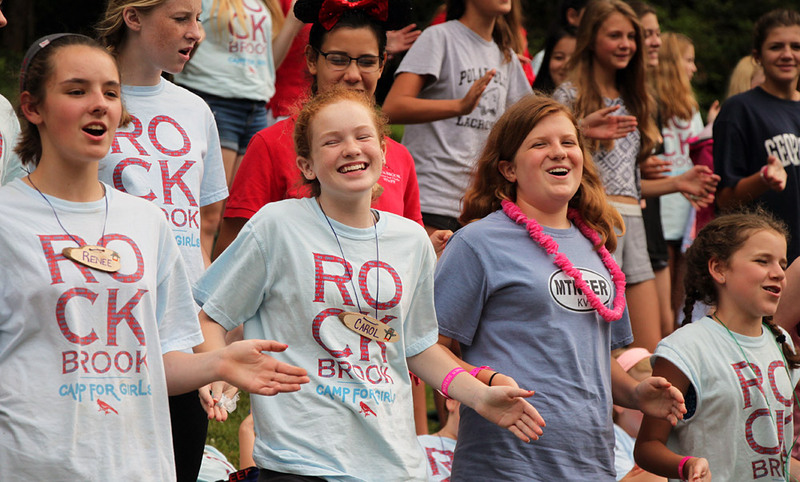 Mostly, and this is the best part, we’ve been thinking about all the great campers who will be attending Rockbrook this summer, all of your great girls. It’s wonderful to see them again, to see how they’ve grown and feel their excitement for camp. 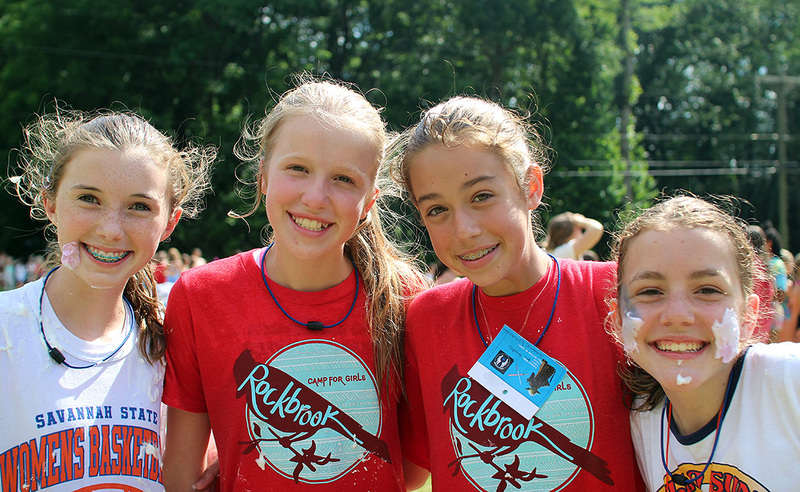 For the new campers too; it’s a delight to welcome them to Rockbrook. Bringing all of this together, the eager enthusiasm and anticipation for camp, made the morning full of smiles, cheers, and hugs. With this kind of feeling, it’s already clear this is going to be a great session. 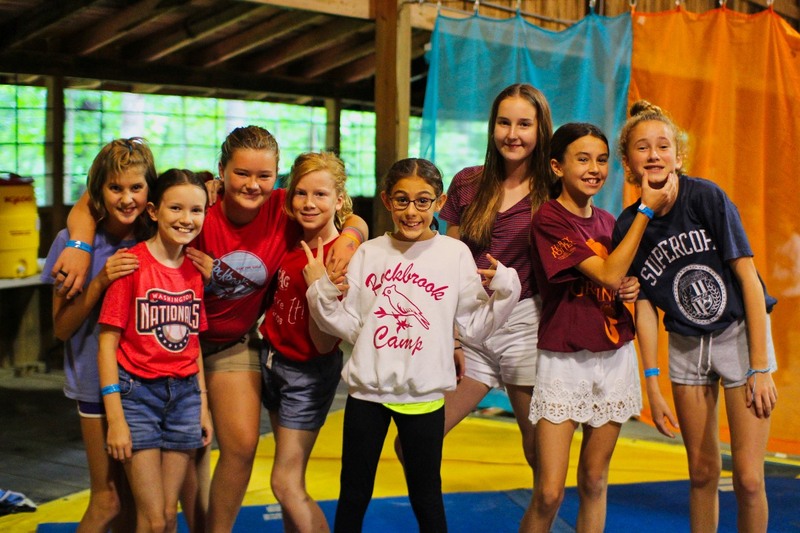 After speeding through the arrival process (perusing the latest RBC gear, meeting the office folks and medical team) and getting settled in the cabins, parents said goodbye and the girls launching right into group games (hula hoops! 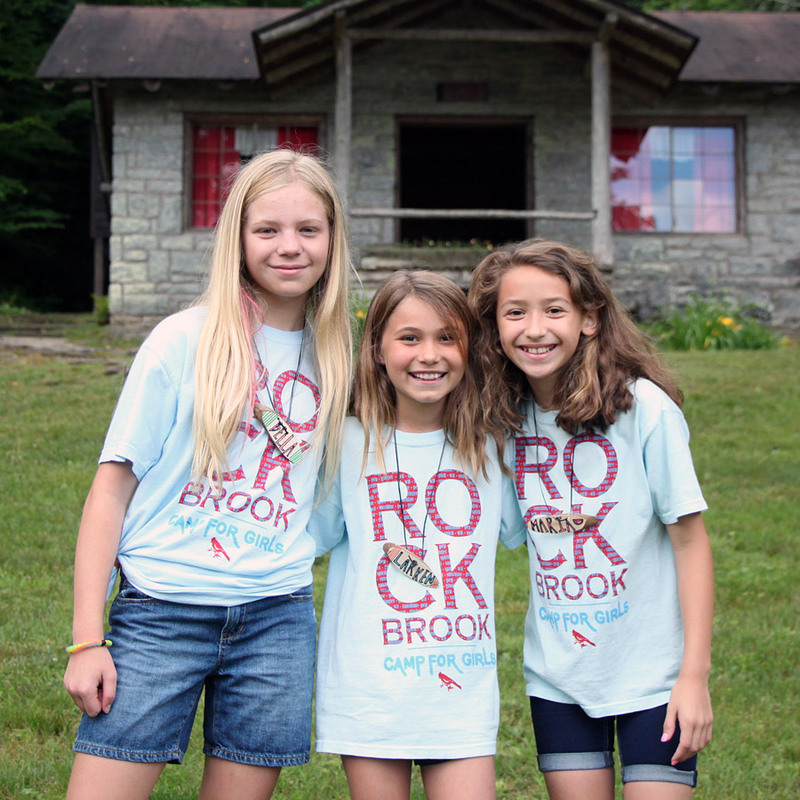 ), hiking the trail to Rockbrook falls, tying their first friendship bracelet of the summer, warming up their tetherball arm, and just catching up with a new camp friend sitting on the hill while enjoying the view. Camp life is life lived outside… or at least mostly outside, with our rustic screened cabins, and daily outdoor activities. The weather is naturally always a factor. Like today when the forecast called for a 90% chance of rain after lunch, we thought we’d surely be unable to open the lake for our “swimming demonstrations.” As is often the case here in the mountains however, the rain was spotty, hitting some places more than others, and we were lucky most of the afternoon. Clouds rolled by with patches of sun appearing now and then allowing us to hold a Reggae dance lake party during the swim demos (with hot chocolate waiting for the girls after sampling the chilly, stream-fed Rockbrook lake), tour all of the camp activity areas, laugh through counselors performing their activity skits, and sing songs together during an assembly of the entire camp on the hill. A sprinkle of rain cooled things down at one point, but it didn’t slow us down much at all. We’re off to a wonderful start. The group of counselors we have this summer, fresh from our week of pre-camp training, is one of the best we’ve ever had. Each one brings talents and skills to teach, but more importantly is a lovely, kind person who will take great care of your girls while here at camp. Likewise, the administrative staff from last year have returned and are ready to guide everyone as we reform the community that makes Rockbrook special. It’s a pleasure for all of us to be here with your girls. If you’ve been paying attention, as we do, to the weather forecasts for this area over the last few days, it would seem that rain would be a constant companion for us. Everyday we’ve been told there would be a 70, 80, or even 90 percent chance of rain. Indeed it has rained every day this week, but happily we’ve been lucky about when it has rained. For example, today we took a group of seniors whitewater rafting, and when we left camp at 7:15am there was a steady, drenching rain. 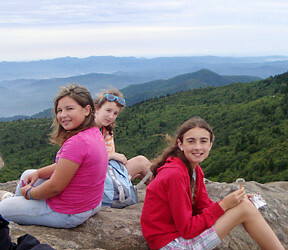 Most of the camp was asleep, but these brave, determined girls woke early and headed out, nervously glancing to the sky. As we drove through the rain toward the Nantahala River, and as the sun rose to heat things up a bit, the clouds parted and we found bright sunny skies. This made for a perfect trip… Fun splashing around, “accidentally” falling in, and the thrill of crashing through each rapid’s waves. 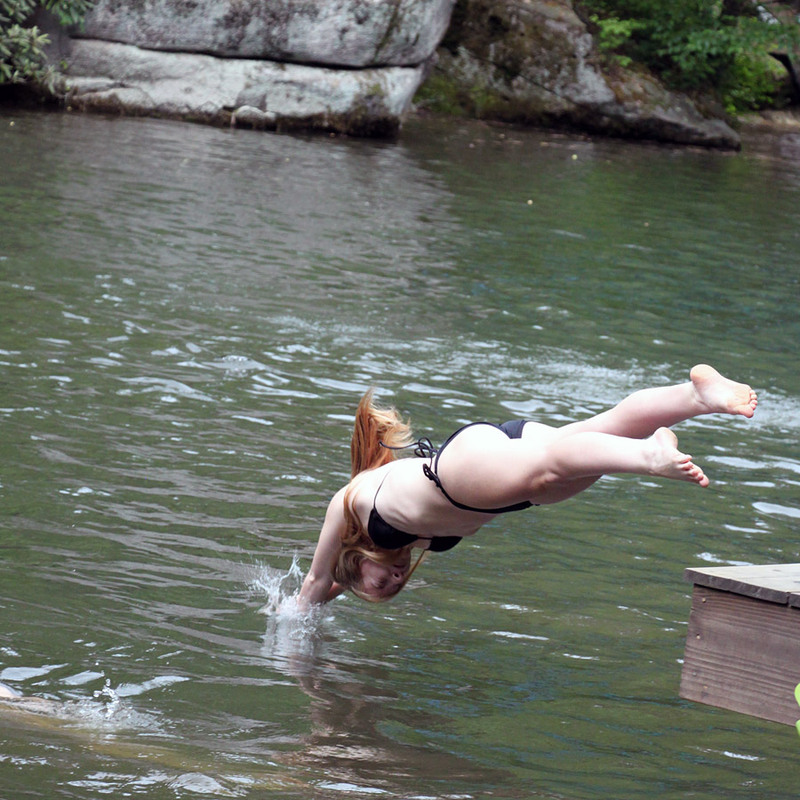 The ordinarily cold water of the Nantahala even felt a little warmer than usual for some reason. 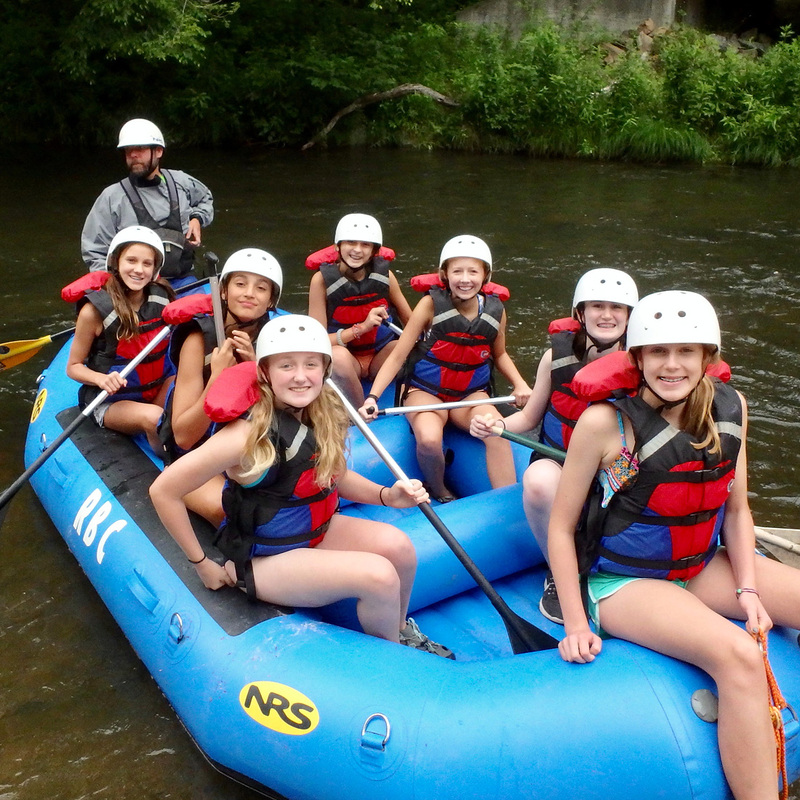 The girls had a blast on the water… the kind of outdoor adventure we love around here … enjoyed a picnic lunch by the “Worser Wesser” Falls, and were back at camp in time for their afternoon activities. In the craft cabin tucked into the woods just below the first cabin of the lower line, the cabin we call “Hobby Nook,” the girls taking “Folklore” have been up to something cool. They’ve been making these neat leather purses. Just a few instructions, and even fewer materials, are needed to get started. The girls cut pieces of soft leather into shapes, punch holes and sew everything together with other strands of leather. Some girls trimmed their creations with beads, while others attached braided friendship bracelet patterns… mixing media and craft activities at RBC! As you can see, the results are dazzling, and a clear source of pride for the girls. I should probably write more about the food we are all enjoying at camp, because it’s been so yummy and good. Rick and his crew constantly amaze and satisfy us all. There are so many examples— his baked cheese grits (with scrambled eggs and bacon) we ate for breakfast, the massive bowl of secret-recipe guacamole he added to our “taco lunch,” the baked chicken, homemade tomato soup, fresh steamed broccoli and warm focaccio bread —all examples of Rockbrook eating well. Don’t be surprised if your daughter comes home with a new favorite food. Maybe it’ll be something simple like raspberries and blueberries on waffles, but it might be lemon hummus with roasted red peppers and pine nuts! The scattered rain showers of late haven’t stalled the action at our riflery range. 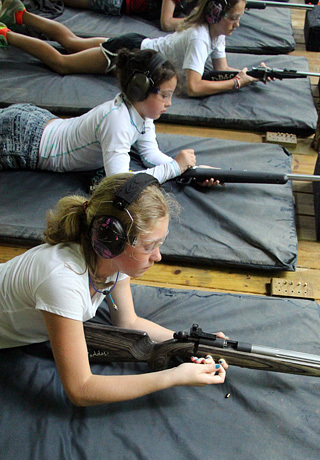 The girls down there, girls of all ages, have been steadily improving their shot. And they have been shooting a lot! From the gym and even from near the lake, you can hear that “pop pop” sound of the .22 caliber rifles discharging. 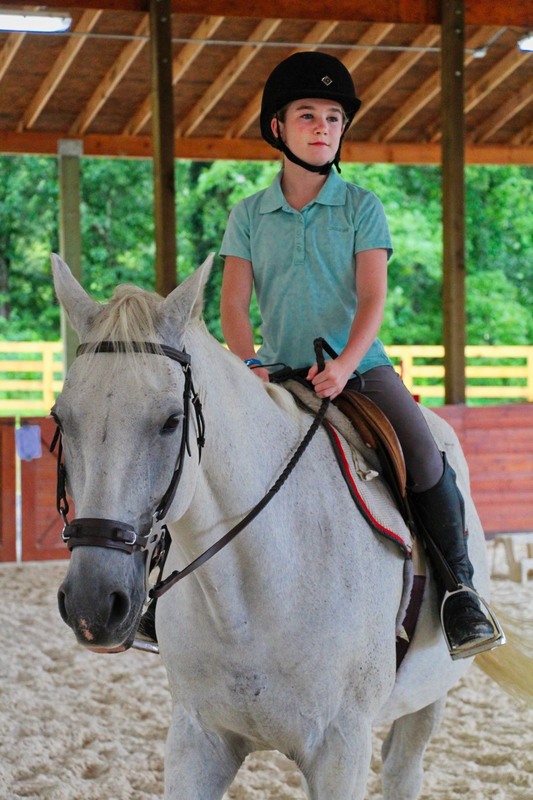 From this photo, you can also see that the coaching provided by instructors Leah and Haley is really paying off. 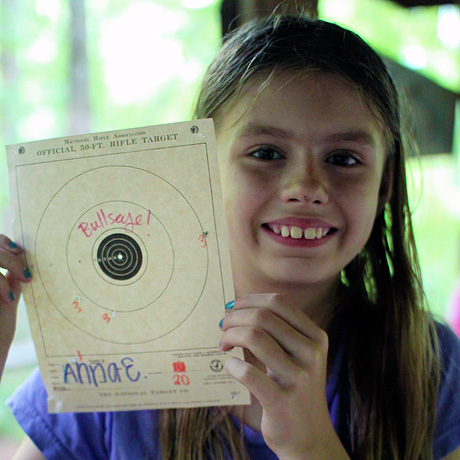 Each day we hear (usually announced to cheers in the dining hall) of new members joining the riflery “Bullseye Club.” Check out Anna’s perfectly centered shot! Awesome! Dinner tonight was another surprise, and a first for Rockbrook. Our 9th graders who are staying for the current mini session presented a banquet to the camp, just as the full session 9th graders will do in a couple of weeks. We ordinarily don’t have a mini session banquet, mostly because planning one (painting decorations, rehearsing skits and dances, designing props, etc) takes more time than is really available in a short session, but this group of nine girls really wanted to do it. And they did an amazing job presenting “Rockbrook Under the Rainbow,” their banquet celebrating “colors.” Each CA dressed in a different color, all the colors of the rainbow plus white and pink (ROYGBIV + WP), and their counselors in tie dye t-shirts. Colorful designs like spirals, stripes, polka dots, and stars covered every wall. A multi-colored parachute hung from the ceiling, and the centerpiece was a “ball pool” filled with bright plastic balls and a rainbow of colored balloons. While this banquet didn’t pull out all the stops of our full session banquets, it showed the CAs’ impressive enthusiasm and their hard work. And judging from the other campers’ excited response— the dancing, singing, cheers and applause —the whole event was a giant success Thank you CAs!